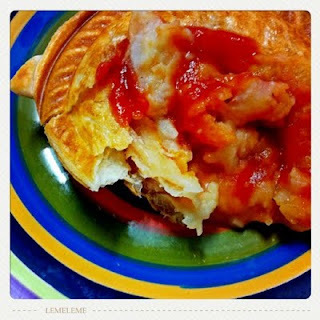 Of the Kitten Kind: Mash Potato and Baked Bean Pie- Yes, You read that right. Mash Potato and Baked Bean Pie- Yes, You read that right. I'm just eating them now... for breakfast. Time: 25 minutes if using an oven, 7 minutes if using a pie maker. Store bought puff pastry (always read the lable to make sure it's vegan). One tin of your favourite baked beans. It's literally store bought vegan puff pastry cut to fit and put in a small pie tin (or pie maker) filled with tinned baked beans and pre-made mash potato. The amounts of these depend on how big your pie is. For mine, it was about 2 tablespoons of each. Start by putting the beans in first and then the potatoes. Put a circle of puff pastry on the top of the pie to cover.